“Very few things inspire us like space. It can be easy to forget what’s over us as we go about our daily lives, but then every night the curtains are lifted and we see this vast unlimited space. Galaxies, stars, planets, moons, asteroids and space dust, unlimited opportunity to further ourselves in our understanding and our capabilities, the notion of being able to leave the surface of our planet it is a relatively new one. The Jet Age was upon us. And the spruce and fabric of the Wright fire had given way to advanced air space alloys. And the chain and sprocket propellers had given way to turbine jet engines and suddenly global transportation on a time scale that had never been possible before became a reality. Something else happened that year.As you all know we walked on the moon. Well. He walked on the moon. But the significance of that was clear to everyone watching at home on earth. And we had built the biggest rocket ever and it worked. Which is amazing and with this, with the success behind us what would happen next. As the rocket continue to evolve. What could we do? We could go to Mars and build a colony there. We could put solar panels in outer space where there are never clouds and there’s never night. And we could beam sustainable energy from space to Earth. Twenty four hours a day. We could build the biggest telescope ever, bigger than any telescope ever built or even proposed to be built on earth, in outer space where there’s no gravity and no atmosphere and we could we be able to not only detect the presence of exoplanets, planets of other Suns but actually see what they look like. We could do all this and more as the rocket of evolved and indeed. Since then we have done amazing things we have put telescopes in space, we’ve have space stations. And all of these achievements are amazing. And we’ve gotten better at making rockets. For example, space X. is now leading the way. And changing what we think about the cost and performance of rockets. But the rocket itself has not fundamentally changed. 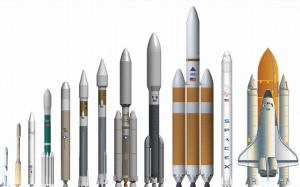 Like the rockets of the Apollo program the rockets we used today are powered by chemical combustion, on using chemical propellant and despite years of work, the cost of space launch has remained tremendously expensive, too expensive for all but a handful of the opportunities that are available in space. So why has have chemical rockets remained so expensive. Well for one reason, they push our abilities to engineer and produce materials to the limits. As an example, the space shuttle main tank holds eight hundred tons of liquid hydrogen and liquid oxygen, a tremendously dangerous combination, and holds this of over several gravity acceleration, all the way from the surface of the earth to space. And yet has a mass fraction of the contents. The space shuttle tank weighs less than an aluminium soda can. If cars were made with this level of materials and engineering< a full size pick-up truck would weigh less than one hundred pounds. Another challenge is that chemical rockets, due to their efficiency limitations, require multiple stages and are generally non-reusable. Imagine if, just to get to work every day you had to ditch your car two or three times to go buy another one. And that’s why it’s so exciting to see Space X. making progress in this area of reusable rockets that’s literally as we speak. But another fundamental challenge is that throughout the history of space flight it’s been risky. Chemical propellants are incredibly energetic, very dangerous. And unfortunately over engineering isn’t an option. You can’t afford the weight that it takes to make a component any stronger than it absolutely needs to be. And walking this fine line sometimes mistakes are made. Could the space shuttle Challenger disaster have been prevented if there were three O. rings instead of only two? So to understand a little bit about why chemical rockets are limited in their performance and how we can get around this will take a very brief course in rocket science. I’m not a rocket scientist and I apologize to the actual rocket scientists for this demonstration but for the rest of us.Rockets work on a principle that we’re all very familiar with. For every action there’s an equal and opposite reaction. The action is a propellant being expelled by the nozzle of the rocket. And the reaction is the acceleration of the rocket. So it’s tempting to think that to improve efficiency of a rocket or to make it better we’ll make it expel more propellant so that it goes faster. But it turns out that when we do this we have to build a bigger rocket because we have to hold more propellant. And the increased force that we gain by expelling more propellant is offset by the fact that we have a heavier slower vehicle and a larger rocket that we need to accelerate. So the real way to improve the efficiency of a rocket is to increase the speed with which the propellant comes out of the rocket. This effective exhaust velocity is the key metric and rocket Scientists call this number, The specific impulse or I.S.P.. And it’s like. It’s the mpg of rockets, not exactly but for the purpose of our discussion. So if a rocket had a window sticker like a car which I’m pretty sure they don’t. It would look like this. And this would correspond to the space shuttle engine which is regarded as is one of the most efficient engines made, all its Pacific impulse is four hundred fifty seconds and why. Why can’t it be higher? Well this engine works by combusting hydrogen and oxygen on these or chemical bonds that are have certain energies. And if you do the math, I didn’t but someone else did, the fundamental theoretical maximum energy available to these propellant would give you a theoretical I.S.P. of five hundred seconds. So the fact of the space shuttle engine can get four hundred and fifty is actually pretty good it did. It did pretty good. But how do we get it higher? And why does it matter? The I.S.P. determines how much you can actually carry with you to space. So let’s assume that we have a rocket. No matter how much it weighs five percent of its mass will be the structure, the mechanical support that holds a rocket together. That gives us ninety five percent of the mass to be either Payload or propellant. Obviously we want to get as much payload to space as we can. What we see is if the specific impulse is below around three hundred seconds in this example. Then we can’t carry any payload to space, the rocket is not going to space at all. Now with the range of a specific impulse achievable with chemical engines around four hundred and slightly above, we see that it’s possible to carry a few percent Payload to space. And that’s why getting the space is so difficult today it’s only barely possible. We can afford to make the rocket any heavier. It barely works at all but if we could improve the specific impulse to a modest number let’s say it can be doubled. To eight hundred seconds. We see that the payload increases dramatically in this case by ten times. And that’s why it’s so interesting and so exciting to work on a fundamentally new technology for space launch. Now. As I said the best known propellant, which are generally regarded as hydrogen and oxygen, are limited in their specific impulse available. So even at thirty six hundred degrees the incredibly hot exhaust that comes out of a hydrogen oxygen engine, these mostly steam molecules are not moving fast enough. So what we can do is instead of trying to get the exhaust to be hotter, we can use a lighter weight exhaust molecule. Hydrogen is a very light molecule and if we can heat it to only eight hundred degrees. It will be moving so fast that it will correspond to a specific impulse of eight hundred to a thousand seconds. Twice as good as steam even though it’s a much cooler temperature and these are temperatures that are compatible with known materials. So the technology that can be used to this propellant, Hydrogen, is something that we actually use every day in our kitchen to heat our food microwave energy. By beaming microwave energy from the ground to the vehicle to heat the hydrogen, we can efficiently propel a rocket to space. Now this idea was actually conceived over one hundred years ago by one of the grandfathers of rocketry. But more recently in the two thousands, work at Cal Tech, NASA and J.P.L. it was done to show that this would become feasible using today’s technologies. And most recently a set-up company was founded by students from Cal Tech. Dmitriy Tseliakhovich, Shaun McGuire and was supported by Richard Schaden, founded Escape Dynamics; which is the companies that I work at. And we have the support of Cal Tech., Of Auto-desk and Singularity University. And we’re putting together a team to bring this concept to reality. Using today’s technology. So what’s remarkable about this idea is that the rocket can be much simpler than chemical combustion rocket engine. 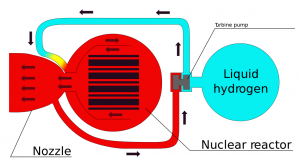 What we need is a tank to hold the hydrogen and below that is a heat exchanger, this is what absorbs the microwave energy as hydrogen flows through this and heats it up for the temperatures needed. So that when it passes through the nozzle it will be converted efficiently to thrust. Now of course an actual vehicle will be much more complex than this. But the fundamental components ultimately are much simpler. So to make this a reality. We’re working to utilize existing technologies and demonstrate them and integrate them at a scale that hasn’t been achieved yet. So we’re working on making high power hundred kilowatt microwave sources called gyrotrons and will be scaling these up to megawatt output capacity to provide the ground based power needed for this propulsion system. We’re developing advanced high temperature materials for the heat exchanger. That will be required both to withstand the great stresses of high gas pressures on an aerodynamic loading, while still also tolerating the high temperatures that will be involved with this. And we’re working on advanced beaming and tracking systems on the ground to enable safe reliable delivery of Microwave energy to a flying vehicle. We’ve been working for over two years now on the safety systems for these to make sure that we can make it safe for people. And yes even for birds to be prevented from exposure to this through safety interlocks. Now there’s another very exciting application of this technology. And it’s something that will be able to demonstrate much sooner than will be able to demonstrate space launch. And that is. We will be able to use this ground based infrastructure to deliver wireless electrical power to AVI’s, to aircraft’s flying through earth’s atmosphere and enabling technology for this is the RecTena which is a combination for rectifying antenna. Something that was invented over fifty years ago by William Brown at Raytheon and working with the team at NASA and J.P.L.. He was able to demonstrate that microwave power can be beamed very efficiently over great distances over miles. And now we’re ready to put this technology to work. So by a coupling this technology with modern UABs which are evolving every day for an interesting number of applications. We’re going to be able to put together U.A.B. systems that can fly and recharge in the air without ever needing to land. So it’s not going to be easy to bring this vision to reality. But we think it’s going to be fun and it’s going to be worth it. So I want within my lifetime to see us go farther than the moon. I would want to see us go to Mars and build the biggest telescope yet. Let’s go mine asteroids. Or leave our solar system. It’s going to be exciting. And it’s going to start with finding a better way to go to space.